Brooksville, FL - Lots of people talk about positive thinking. Here's how it REALLY works. Every person on the planet has the ability to learn how to program the theater in their mind. I was abused as a child. During beatings, I closed my eyes, pictured and visualized being at my Aunt Honey's house. If I was mentally somewhere else, I physically didn't feel the beating. My parents would say, "Boy, you're not going to cry at all, are you?" I blocked it all out, didn't feel it. That was how I dealt with it. So early duress forced me to learn to program that theater in my mind. YOU have that same ability. You can close your eyes and go into that perfect, perfect day. My perfect day is scuba diving down in Looe Key, near Key West, with my wife Linda on the surface and my daughter Amanda waving at me. My son Matthew is next to me. I see very distinct details: our bubbles rise to the surface and break on Linda's & Amanda's masks, Linda's hair floats out on the water's surface, total detail. And a lot more. "This is a VERY Big Deal!" My primary company announced a contest to give away a BMW 325i. I thought, "Wow. You can win just by going to Convention. That's a great way to show our team what the mind can do. I'll go ahead and win that car to show them the power of visualization, going into that theater in your mind." I told Linda, "Babe, this is a VERY big deal. We want to prove this, but it's a BIG request, to get this car. So I need you to help me visualize, to put a lot of positive energy into it. And NO negatives." 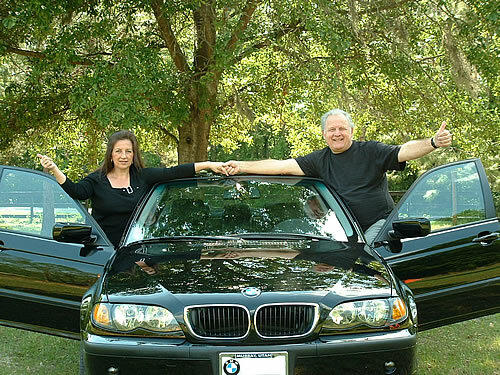 We went to the Tampa BMW dealer and got their 46-page, full-color 325i booklet. It has sample interiors, textures, & paint samples. You can feel the leather. The paint samples are slick and so shiny you actually see your reflection. They do this so you visualize yourself driving this car. On the 50-mile trip home, Linda read me all the cool features. I called company headquarters for Convention info. I misunderstood what they told me, which was almost a disaster. I somehow thought the car was a BMW 325i black convertible. I had a convertible once. Who wants to drive around Florida with just that thin canvas over your head? It's hot down here. I like a T-top or a removable hard top or a sun roof. I really don't like a convertible! But I was winning it just to prove a point, so I threw out that negative thought. Online, I printed out photos of a black 325i convertible to focus on. But the black canvas top is black like the car. It almost looks like a coupe. That's probably what saved me. 1500 people were going to Convention. All who registered early got 5 chances at the car drawing. So each day for 2 months before Convention, I spent 3 or 4 minutes with eyes closed, in my mental theater, focused on this car. I saw the dash, speedometer, steering wheel, stereo. I had printed pictures of all and taped them on my wall. I looked at the pictures, closed my eyes, felt and smelled the leather in the brochure, felt the shiny paint. I visualized that car as reality. Linda got a gorgeous BMW keychain, adding to my picture. I visualized going onstage to get the keys, saw a lot of people I didn't know. I heard the announcer, but not the crowd, just some muffled, very distant sound, like when your ear pressure equalizes during flight. I pictured getting the winning key, sitting in the car, starting it. Another part came clear a couple days after we got home. My picture always ended with Linda running to me, crying "We did it! We did it!" And in my visualization, she had a corsage on her dress. But that flower didn't really register consciously in my picture. Linda told our friends we wouldn't be home Sunday night, that it would take 3 or 4 days to drive home. We had a couple people we wanted to stop and see along the way, let them take the car for a spin. When we left for Convention, Matthew dropped us at the airport. There was no sense leaving a car there when we'd be driving the BMW home from Salt Lake City. I told my friend Dave Cones we'd stop by in Oklahoma to see him on our drive home. Dave & his wife Kathy got a bedroom ready for us. We arrived at convention. I saw the car, Uh-oh! It was a loaded-out 325i hardtop. That stunned me. I'd been concentrating on and studying for a black convertible the whole time. But I quickly adjusted, because the hardtop was my perfect choice. OK. The big day comes. Saturday afternoon, before the drawing, I ordered wrist corsages for Linda and Joy Seward and Nancy Olthoff. But when I brought the corsages upstairs and opened the box to put one on Linda, it wasn't a wrist corsage. It was a pin-on. Linda smiled and said, "Well, everything happens for a reason. I guess we're supposed to have corsages on our dresses." I said, "Oh, OK." Never thought anything about it. Until later that night when we won the car. When Linda ran and jumped into my arms, I saw that corsage. It was the EXACT visualization from the perfect dream I'd done every day for 2 months. I had visualized just 3 or 4 minutes a day. Once you program yourself with all the details, it just takes seconds to see yourself in the car, smell the leather, feel the leather, look at the paint, see the dashboard, turn the key, hear the car start, see Linda come running. Close your eyes, click your fingers, BOOM! You're in that dream, in that visualization. I've done this my whole life. I've used this technique for 50 years. When I told a friend of mine I was gong to win the car, he said it's like asking to win the lottery, it's an area where I have no control. But the fact is, it just doesn't matter. If you visualize it, if you manifest it and put that picture out to the universe, the universe will bring it to you. I don't care WHAT it is. It does not matter. So how can YOU do this? Put it out there. Visualize it in every detail. Manifest it in your mind. (Look up "manifest" in the dictionary!) I wanted to prove to our team that they can do it. I had my wife's help. I had the team's help. Of the 1,500 people at the convention, over 100 were from my group, all rooting for me. The day before the car give-away, the conference host announced that my friend Laura would compete in a contest for a surprise reward. Laura was in my group. But on Monday, Laura called and said, "Michael, my sister's son has a tumor. They have to do surgery. We can't go." Laura & her husband not only had a serious family illness, they lost the money for their plane tickets. So I went onstage and played a company quiz game for Laura. I won. Next year, the company is going on an 8-day Mexican cruise. Laura & her husband now have full-expense paid airfare plus tickets for this luxury cruise, balcony cabin, etc, about a $3,000 value. 1,500 people saw me win that cruise for Laura. How many put positive energy into the atmosphere for me to win the car over somebody they had no connection with? I've been told a lot of people were pulling for me in a spiritual way. All that focus & positive energy helped make it happen. So Saturday night, at the end of the conference, they held the car drawing. They had 7,500 tickets in a crank basket with a trapdoor on it. They rolled out the basket, spun it, and pulled out 5 names. First name called was Dan Svoboda, one of my personally-sponsored distributors sitting at my table. I thought, "Good start. Good sign." Dan ran up onstage and shook everybody's hand. Then they called the name of a lady I didn't know. She went up. At this point I scooted my chair back, buttoned my jacket, leaned over and kissed Linda. She was rubbing the BMW keychain. Then they called me. I had seen this every day for weeks. Visualized it. Focused on it. Everything was normal until I put my hand on the rail to climb onstage. Then it was like a time-warp. The crowd was cheering, but the sound was cut by 90%. I saw bright lights and shook everybody's hand. Two more ladies were called up. The host held a stainless steel goblet-looking bowl high in the air, 5 keys inside. Each finalist reached up and grabbed a big round rubber head BMW key. First Dan, then the lady. When I reached in the bowl, I felt one key stick above the others. I grabbed it. But when I pulled it out, another key was tangled in it. Time for focus and positive energy. I quickly asked myself, "Which key?" My mind said, "First choice." I looked, and the one I had the most grip on was "Key #2". So I dropped Key #4 back in the bowl. I held Key #2. The company President said, "Wow. I think that's the lucky key." The last 2 ladies chose their keys. We were all set. The announcer asked, "Are you all happy with your choice? Anyone want to trade keys?" I said, "No. I have the winning key." Everybody else was happy, too. So the host offered, "How about $1,000 cash money right now? I'll buy your key!" Dan Svoboda went first. He got to the car and they offered $1,500 for his key. He turned it down, sat in the car, put the key in the ignition and turned. Nothing. The next lady tried. Nothing. The host asked, "Would you like the ladies to go first?" I said, "Absolutely. Ladies first." So the ladies did rock-paper-scissors to see who would go. The lady next to me won and tried her key. Nothing. It was down to two. I turned to the company President and said, "Why don't you let this lady go?" He asked, "Why?" I said, "Well, I have the winning key, and she needs the experience of sitting in that car, smelling the leather. That's pretty exciting." He said, "You're very confident." I said, "Yeah. I KNOW I've got the winning key." We did rock-paper-scissors. I won. I let the last lady go ahead. Everyone Knows It's My Car! People were screaming, clapping, cheering. I could barely hear them. Linda came running up and jumped into my arms, screaming "We did it, we did it, we did it!" Even without the car, it would have all been worth it, just to see Linda's face. Of course, she had on the black dress with that white corsage. And THAT was the end of my vision, the end of that dream. It was like someone flipped the switch back. The volume came back on, the speakers came back up, and I could hear all the noise in the real world. The company execs looked at me like I should do backflips. They didn't realize I'd already been here every day for 2 months. I'd already had the experience. Someone said, "The key! The key! You gotta start the car!" So I stepped away from Linda, stuck the key in and started the car. I had visualized it many, many times. What was amazing to me was, apparently the florist knew that for my visualization to be accurate, we needed a lapel corsage. Everything happens for a reason. And that's the story of the BMW.